I rarely pull out my dusty old trident, but in this case, here goes. I was a Navy SEAL officer in the 1980s, and this kind of operation (transiting small boats in foreign waters) was our bread and butter. Today, these boats both not only had radar, but multiple GPS devices, including chart plotters that place your boat’s icon right on the chart. The claim by Iran that the USN boats “strayed into Iranian waters” is complete [bovine effluvia]. This entry was posted in National defense, News, North Africa, Politics, USA by Baron Bodissey. Bookmark the permalink. Well, you know, when I saw the story flash, I was assuming that the incident was done by the Iranians on Obama’s request, so he could buttress his story on how easy it was to “save” our forces because of his diplomatic connections with Iran, and to preserve the deal he made with them. But hey, I am just a nobody. No, I don’t believe ANY of it. Not one teensey tiny little bit, I don’t. The intelligence services and brass must know the tensions in the area, so why even send two small boats anywhere near areas controlled by the Iranians. No air cover, no larger ship nearby to offer backup. The point about gps being taken to obscure where the boats were taken, I would have thought that both boats would have been actively monitored via gps so their location would have been known at every step and a recording of such would be available if needed. A weird game is being played out here and the Americans have lost this round. At least no one died like those left to die in Benghazi. At least no one died? None of the Americans died, but that bill has yet to be totted up. If Obama hadn’t been in office, the whole farce wouldn’t have occurred. Obama’s deal with the Iranians will cost us thousands of lives. It takes no genius to understand that. The ships were within 12 miles of Farsi Island..
Its about 50 miles offshore, and all the water to the east, is in Iranian territorial water, and you need to go right by it, in a 52 foot boat for what reason ? The island is right on the 28% North line and the water there is 150 feet deep. Lucy, somebody gots some explaining to do. Yes, I agree Vera. Considering who Obama is and what he is, I feel this “capture” might have been planned between the United States and Iran; i.e., to make Iran appear benevolent while the United States looks like a second rate power. What happened to name, rank, serial number? Expect capture — expect interrogation. The female sailor was out of uniform by wearing that insidious burqua and should have refused to wear it. There seemed to be no discipline among the American sailors. Isn’t there Sat/Nav tracking independent of their GPS to verify and record heading and position? Obama MUST be exposed! Or will we go the way of Germany? Minor point, it was just a headscarf, not a full out burqa..This time. I doubt very much that the boats automatically uploaded their positions via satellite. That would be a disaster in wartime, and is not even really a nice, unless one was very very certain of the encryption on the uplink. GPS can tell you where you are, and what your heading is, but that’s done on the boat, using signals from the GPS satellites. The satellites can’t track anything, they just send out what amounts to a beacon, albeit it with a signal that allows the receiver to measure distance to the satellites and the relative velocity along the line of site to the satellite. They also tell where they are. This allows an analog of triangulation, only using distance rather than direction/angles. An AWACS in the area is a possibility, but they can only see the surface out to about 210 nautical miles, while they can see airborne objects a lot farther away. Any AWACS in the area would likely be much farther than 210 nm from the area, since the current area of interest is in central and northern Iraq. A Saudi AWACS might be up and watching the Iranians across the Gulf, or down by Yemen. Btw, thank you for your service, Mr. Bracken. If you had been “detained” by the Iranians, how would you have handled the situation? I don’t know. We (meaning I if I was in charge of the boats) might have disobeyed our ROE about not firing back. I’m wondering what kind of jamming the Iranians used to prevent any outward mayday calls. Or perhaps they were sent, and we’ll find out in hearings about 3 years from now. But for now both the Obama/Kerry team and the Iranians are agreeing to pretend that the lies are the truth. Back in my day commo was much more rudimentary, now they have satphones etc. Hard to imagine a total spectrum jamming, but I suppose it’s possible. I’ll also bet the sailors will get worse treatment by the USN now, ordering them to shut up forever, than they got from the Iranians. If one of those sailors is a short-timer, with a short-timer attitude, and he goes on leave and then winds up on Hannity spilling the beans…. I’ll bet those sailors are all getting new assignments at the South Pole. Without communications. What were 2, fifty two foot long boats, doing, by being within 25 miles of there ? Weapon Has a different take. ROE in re Iran as far back as 2003 in Naval Coast Warfare Group One was to “take cover and call higher for guidance”. Armed Iranian boats were not uncommon near the GOPLATS. 3 guys were killed in early 2004 by a suicide boat, but chain of command was ALWAYS more worried about firing too quickly than they were about not firing quickly enough. This isn’t unique to NCW, it’s a Surface Warfare culture problem that stems from the concept of how you “fight” a ship – the individual sailor isn’t a fighting unit. His job is to operate the weapon while the CIC tells him where to point it and when to pull the trigger. Also, keep in mind that Achievement Medals have been awarded to junior sailors in that AOR who didn’t open fire when the ROE clearly indicated that they should have, but imperiled themselves and their ships waiting for higher to decide not to shoot for diplomatic reasons. The word is generally out – if you don’t shoot and get blown up you’re a hero, but if you shoot and are wrong (based on things you couldn’t have known at the time) the CoC will hang you out. 3) To our eternal shame, the whole reason the USN has this mission at all is because the USCG was too risk averse after losing Nate Bruckenthal in the KABOT bombing & waved off, in my opinion. 4) Given all of the above, I’m surprised that they had ammo or weapons at all. They were reportedly doing a boat swap between Kuwait & Bahrain. The basic load of ammo in NCW is probably 10% of what NSW would have on the same boat. At kickoff in OIF we were handed 3-30 round magazines and 90 rounds each by NCW. It’s a cultural problem with the fleet Navy that’s never going away. Our current ROE is craven. 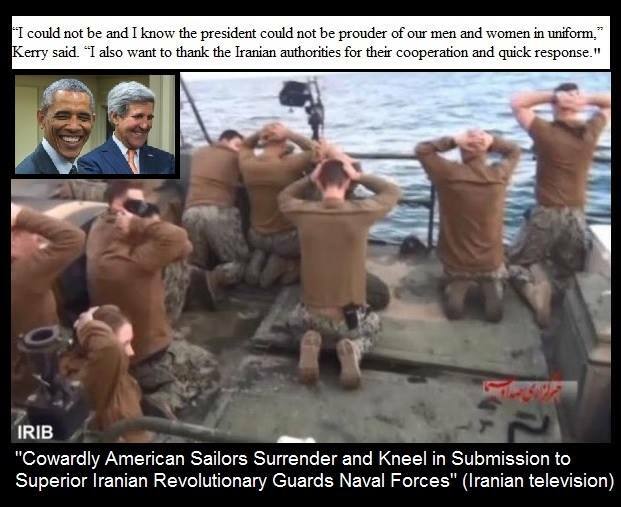 It is beyond a normal person’s credibility to believe that this wasn’t a set-up between Obama and Iran with Kerry acting as The Fool. The man ought to have to wear motley and carry some kind of clown noise-maker. we know that all electronics were confiscated from the sailors as well as from the boats. The sailors and boats were subsequently released. Focus on the seized electronics. We know the GPS equipment was taken. GPS hold coordinates which the Iranians suggest will prove our sailors drifted outside of international waters. Surely, these boats were being tracked at some base on a nearby ship – right? We already should have that information which would prove the Iranians wrong. So, why else would the Iranians take the electronics? Was this an incident in which rather than delivering goods directly (aka jizyah – related to current Obama deal), could these electronics hold global coordinates for pick up of (as yet not publicly disclosed) goods promised in that deal? Jizyah is not simply handed over…it is a deeply humiliating exchange providing ‘tribute’ to the conquering Islamic overlords. For the dhimmi, the annual jizya payment was a powerful and public symbolic expression of the jihad-dhimmitude nexus, which fixed the horizon of the dhimmi’s world. Although the ritual varied in its specific features, its essential character was an enactment of a beheading, in which one of the recurrent features was a blow to the neck of the dhimmi, at the very point when he makes his payment. “On the day of payment they [the dhimmis] shall be assembled in a public place like the suq. The video taped, capture, seizures, public humiliations, apologies all fit horrifically into this degrading cultural edict/tradition . Obama’s ‘apology tour’ just graduated to yet another degree of dhimmitude by deeply humiliating our NAVY and imposing his disgusting brand of ‘dhimmi-diplomacy’ upon this entire nation. I’m at the point where, like Cesar, we MUST cross the Rubicon. And waiting is a BAD option. It allows the enemy to dig in and indoctrinate the youth for longer and longer periods, diluting the native culture for some make-believe fantasy. We must instead be Naku. Eventually, it might change, but for now…. I believe that’s called his mouth…. The minute I heard this story I said BS. Iran is testing Obama and finding out he is a worthless wimp. American people and the values America espouses. This is the reason why the Framers stipulated “natural born”. Obama is a dual citizen. I’m sure the Founders are spinning in their graves. Why hasn’t he been impeached yet? Is treason not a “high crime”? Even if treason were not a “high crime”, it’s specifically mentioned as ground for impeachment in the Constitution. Once impeached and removed, then the criminal charge of treason can be adjudicated. Prepare the rope! Oops we don’t do it that way any more. Might be time to bring it back. Is anyone sure it was “Iranians” making the capture? Or was it “I******s” posing as “Iranians?” Or was it Iranians under the direction of a third party (you-know-who) calling the shots? I do not believe anything given over for public consumption. Everything is manipulated. Nothing is as it seems. Tonkin what??? For God’s sake when will be ever get another Patton to blow these scum to smithereens? Next time send a couple of Marines to protect the squids. iran did this to our navy personnel ( I mean the Royal Navy, of course) in, I think, 2007. It’s an exercise in public humiliation and it seems to work for them. They kept our men and women for about 2 weeks before the iranians released them minus boats and equipment. I think it’s about time we gave them a dose of their own medicine and teach them to behave themselves or there will be consequences. I would have thought that would be very easy to arrange — if there were a will to do it, that is. Which is the real question. Mark Steyn’s latest compares that incident with the current one. A good piece, even by his standards. Just to sound a discordant note in this hubristic chorus: What was an imperial boat doing in THEIR back yard? Who is spoiling for a confrontation? Leave the hell-hole, and tell the war-profiteers to stop baiting the crazies. However much this farcical incident may have been staged, I am relieved at the outcome and that the sailors are safe and unharmed. War is not a game. The imperial naval strategy is not making the West any safer. It is only making some already-rich folks much richer . . . and diverting scarce resources away from the real fight. It may be an imperial navy, but without it in the Persian Gulf, we would be joining gas lines. The navy keeps the pirates at bay. “Joining gas lines”? Even if the Arabs never pumped another drop of oil, there would be a surplus of shale oil from North America. Current low oil prices are a last desperate attempt by the Saudis to break this industry. It will fail, of course. Shale oil operations, now uneconomical, will be mothballed temporarily but come right back online at the first price hike. The main reason Americans want to control the middle east is to control the financial aspect of oil trade. They force transactions to be conducted in the USD, thereby maintaining the American dollar as the world’s reserve currency and propping up its value artificially. Look at what happens when any nation threatens to set up an oil bourse to sell the product in its own local currency…their government is overthrown immediately by the Americans. IMO, it was staged between this admin and Iran because people are very angry about Obama’s sell-out “strategy” that brings only more turmoil to MENA. Come on, what is there to trust about the timing “coincidence” with Obama’s last State of the Union speech? Agreed, this president and his administration have done NOTHING to make the West safer, least of all his own country. This incident happened paradoxically because America is still greatest naval power on Earth. American boats patrol straits and merchant routes because that ensures continuation of one of the bases of Breton Woods system, and USA as a world’s hegemon. What is worrying here is the following: if little Marxist CIC cannot use Forces properly in the Gulf how can the system be upheld in South Pacific, where room temperature war is happening between China and US. I’d like to know the size of territorial space claimed around the island. Does anyone know? The only way these jet boats could have been disabled was if debris entered the salt water intake. Without a filter on it, the engine would then overheat quickly. But I too doubt that happened. More likely they were taken in international waters. This is a huge scandal that the LSM will not investigate. But we can and should get this story out over social media. They’re on their knees but you claim they are wearing t-shirts. Those are not t-shirts, that is #1 mistake. And the female did not have any thing covering her head you can see her face and hair, #2 mistake. So if (you) claim you have seen this happen you are full of [bovine effluvia]. You never even served in the arm forces and you are a coward like Obama and Clinton. They are not wearing t-shirts? What are they wearing, pray tell? Strategically – External and Iranian internal propaganda. Tactically – Separating and and humiliating her in front of the group and proving to her she is unprotected except by the grace of her captors. Demonstrating the helpless and fear of the males (to the males not just observers). The female becomes the O-in-C’s jizya (no torture, though that is a possibility, she is simply among them as submissive and vulnerable, a constant reminder of the impotence of the chain-of-command, thus undermining whatever unit cohesion remains.). No one in that group will forget the doubts and questions that came to mind while kneeling there. Only a metrosexual would fail to receive the message loud and clear (and they only because it is morally talking over their heads). Capturing a female increased the value of this for the Mohammedans by an order of magnitude. While the Western chain-of-command thoroughly absorbs the purely Marxist political construct that the word warrior is gender neutral Seventh-Century societies don’t chase unicorns, much less create tactical gaps to accommodate the magical powers they bring to the battlefield. “If my countryman is not returned to us by tomorrow evening, in good health…(at that point he took an expensive watch out of his pocket, dropped it on the floor and ground it to pieces under his heel) then THAT will be your holy city of Qom”. The story went that the Russian was indeed returned in good health. Don’t know if this was true, but that IMHO is the way to go. Surely someone has at least a few hundred missiles trained on that black cube they all pray to in Mecca. There’s another story about a time when a Russian was kidnapped in Lebanon back in the ’70s. I don’t remember the exact details, but the Russians did something like deliver various body parts of the deceased kidnappers to the front steps of their families when they woke up in the morning. No more Russians were kidnapped in Lebanon. The way I heard it the Russians delivered body parts of the immediate families (all of them) of the kidnappers to the headquarters of the organization that sponsored the operation with the comment that the where-abouts of the leaderships relatives were known. The hostage was released before sunset and the kidnappers “disappeared”. Who knows which is accurate. Yours is probably more accurate. My memory is a sieve. There must be another Patton somewhere rising through the ranks, surely to God! Anyone with that caliber of brains or [manly reproductive organs] is being drummed out for “conduct unbecoming (a [milquetoast])”. It’s not his own country — he’s not really an American and therein lies much of the problem (among many others). Matt, I was a pilot in HCS-5 (former Marine 46 pilot). We trained with you guys a lot in Niland, Fallon, Hawaii and Thailand and it was a pleasure being glorified bus drivers for you guys. I did the three weeks deal in Hawaii (Ford Island) and saw you all more up close than even Niland. The fast boat stuff was a blast not to mention live fire ex; a real E-ticket flight watching you guys. That being said, when I first heard about this last week and after seeing how you train, plan and detail exactly everything (and being chewed out once for landing a meter off, can’t remember his name but the chief with the handle bar mustache came to my defense), I knew this had to be coordinated by the president for whatever reason. There simply is no way this was a screw up on the SEAL’s part, no way. I commented as such at Lucianne last Tuesday. The only way it could have happened from my limited time training with SEALs is by ambush, knowing when and where these two boats would be. There’s only one guy I know of who would gladly give a service member’s life away for his own gain. Sadly he lives on Pennsylvania Avenue. I wish this country could fathom what a gut punch this is and in my opinion given to us by the president. Superior speedboats? The boats alongside ours were pitiful. We can pull 43 knots or so in ours, and THEY caught US? No freaking way. It would have had to of been a wall of the little [epithets] Iranian speeders to stop ours. I reject the idea that they lost navs. Too damned much gear on board for it all to fail. These weren’t SEALS. Who was the woman? Marines? Too much pride to get into this trouble – especially without firing a shot. Either this crew was a collection of the stupidist of the stupid, or they were there on purpose, to hand over a sweet little political news coup for the Iranians. No way this was a professional pair of crews. The weapons load they had looked to be sparse. What’s up with that? Inter-base transfer near Iranian waters with active tensions and they don’t gun-up? I served in the NAVSPEC WAR community for most of my career…most of it in SBU and IBU Squadrons…although I did some time at SDV Teams ONE and TWO and on a couple of Tin Cans. I retired in 2001 but like you I pull out my old Combat Craft and SWCC Pins once in a while. I was pretty PO’d at the story and I had a lot of questions….many of them echoed by you and many others. ABSOLUTELY….there is something not right here…and there are still nagging thoughts about how, what and why on several things. Hopefully the TRUTH will come out .